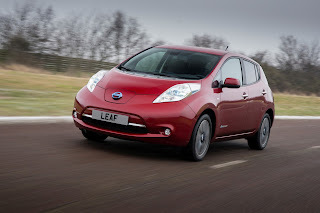 In Europe, Nissan is now offering customers the chance to buy the 2013 Nissan LEAF vehicle, but lease the batteries. That means you can now have a LEAF Flex for £20,990 and tack-on another £70 a month to lease the batteries. The Tekna LEAF will cost customers £30,490, which does include the batteries. According to Nissan, the new LEAF has more than 100 improvements when compared to the current LEAF. The new LEAF comes in a choice of Visia, Acenta and Tekna trims – with the ‘Flex’ bit for the battery lease on all trim levels available – with the Tekna option getting some attractive goodies, including Bose, 17″ alloys and LED headlights.